Peterson Portable Sawmills have recently joined forces with a rising star of the Stihl Timbersports Series, Nathan Waterfield. Nathan was born and raised in Warren, Pennsylvania where 100 years ago logging, sawmilling and wood processing was a major industry. Now the area is a mixed market of oil and natural gas, dairy farming, and forestry. As a child, Nathan enjoyed sports and played American Football, Wrestling and Track and Field but most often he spent time in the outdoors with his grandfather, Lee Rubright. Lee played a big part in Nathan’s upbringing. He would teach his Grandson how to drive machinery and even how to shoot. They often went hunting for Whitetailed Deer and Turkeys in the fall and winter. and his brother Matt, rolled his Grandpas fourwheeler bike while riding through the woods. “Grandpa was clearly very angry, but he was holding his tongue at the same time. We were okay and uninjured, and the machine could be replaced,” Nathan recalled. While still at school, Nathan began his first paid job when he was 12, working on a hay and corn farm. At the farm, he was able to run many different types of equipment, but his favourite was the hay bailer. Unfortunately for Nathan, it wasn’t all about bailing; there were a dozen pigs on the farm and he would often have to shovel the manure and slop, which he admits he did not enjoy. Nathan is self-employed, and earns his living by writing management plans for private landowners. He has also invested in a bucket truck that he enjoys, and he is looking at doing more contract arborist work with it in the future. When the weather is poor, Nathan builds furniture such as bed frames, tables, and chairs from logs and branches. Nathan first got involved with timber sports in 2004 when he competed in a few collegiate events. He enjoyed it so much that in the following summer, he entered into some semi-professional shows in New York State. 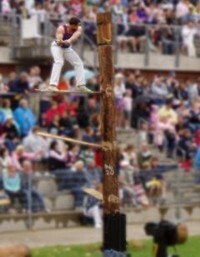 Being self-employed gives Nathan the flexibility to take part in timber sports competitions. “Because wood chopping requires so much time to train and travel, I don’t think I would be able to devote as much time as I do to the sport while working a ‘normal’ job,” he said. Nathan’s strongest area within his sport is chopping. He has won many awards in this area including a first placing in the Axe Throw at the South-Eastern US World Championships, in West Virginia USA. He also got a win in the springboard and a second in the standing block at Festival Forestier de Senneterre International Competition, in Quebec, Canada – his USA team even won the North American Challenge at this competition. Nathan loves competing and the feeling of camaraderie among axemen all over the world, and the sport has taken him to many of his fellow competitor’s homelands. Included in Nathan’s long list of countries visited, is New Zealand where in 2007 he trained and competed at shows. This is where he first laid eyes on a Peterson Portable Sawmill set up for demonstration. Nathan had always been interested in turning trees into lumber. He had run bandsaws in school, but was disappointed in their productivity and inconsistency to make accurate lumber. After learning more about swingblade sawmills, in particular the Peterson brand, he was fascinated in the design. Peterson’s swingblade mills use one circular blade, which pivots from the horizontal to the vertical position to cleanly cut one board at a time. The mills can be set up over a fallen log in the forest, or fixed in a stationary position in a lumberyard. bandsaw. Bandsaw owners go through many blades in a year, whereas Peterson owners have been known to keep their blades running well for over 10 years. 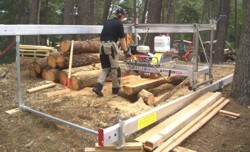 Because of Peterson Portable Sawmill’s proven product and good reputation, in 2007 Nathan decided to contact the company’s headquarters in Rotorua, New Zealand and ask them if they would be willing to sponsor him. After a little research into Nathan’s involvement in his sport, the company were very eager to begin their relationship with him, particularly after hearing such great feedback about Nathan as a person and a sportsman. Nathan officially signed as Peterson’s Promotional Representative for the USA in March 2008, and although on different sides of the world, Nathan and his new friends in New Zealand look forward to a very close and productive relationship. “There are many big companies out there that could have been potential sponsors, however I knew I couldn’t have a personal relationship with them like I do with Peterson now,” said Nathan.